It was a little bit sad this morning to see a Nikkei business report describe the ways in which a technology with huge potential to redress the world’s problems regarding hunger and food scarcity is only being developed to soothe what is, quote: a ‘growing awareness about food safety among the middle classes’ (or, perhaps, their scruples regarding how many bad bacteria lurk in leafy greens). Nevertheless, like many new technologies, hydroponic farms – the buildings that house, for all intents and purposes, acres and acres of soil-free arable land, all stacked on top of each other in slide-out trays, sustained by nutrient water and LED lights – are too expensive in these early stages to serve everybody without a large degree of beneficence. Still, if things do pick up, they have real potential to do worlds of social good. China has long led the hydroponics movement; and now, in Hong Kong, the popularity of such farms is on the rise. 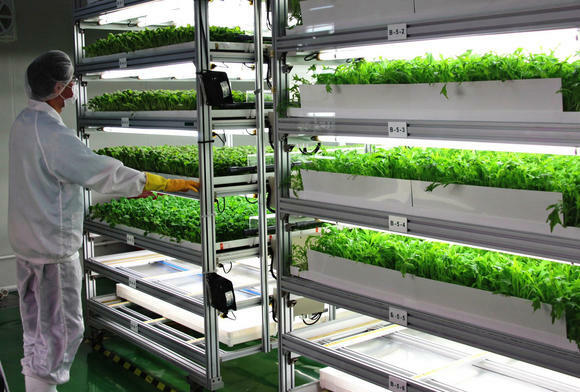 Since the arrival of the first hydroponic farm in the autonomous territory in 2013, twenty new companies have entered the Hong Kong market alone; and the amount of food produced by hydroponic farms each year has reached 750 tons. It’s not much; but it’s certainly an exciting start. Indeed, the farms themselves are popular by virtue of their sterile interiors. The environments in which the plants are grown are temperature controlled and air conditioned, shut to the elements and pollutants in the ground. Even the workers wear full-body suits, dust masks and thick rubber gloves. So popular are they that VMO now claims it is looking to expand its operations by diversifying the types of vegetables it produces. At the moment, limited scale is holding things back. But in the future, hydroponic farms have real potential to help reduce global inequalities regarding hunger (albeit not alone). What’s more, with such massive problems arising from the encroachment of big agribusiness operations upon large sections of inhabited land across the world, condensing the same surface area into a vertical column is one way in which tensions could be eased (although it wouldn’t necessarily ameliorate the underlying issues which drive such change). Nevertheless, it seems that if we do indeed see such a day, it will have all been made possible in its early stages by certain customers’ desires for increased food safety in vegetable products and a fear of pesticides and other contaminants.